I just submitted all of my tax documents to my accountant and thought this would be a great thing to share since taxes are something EVERYONE deals with! 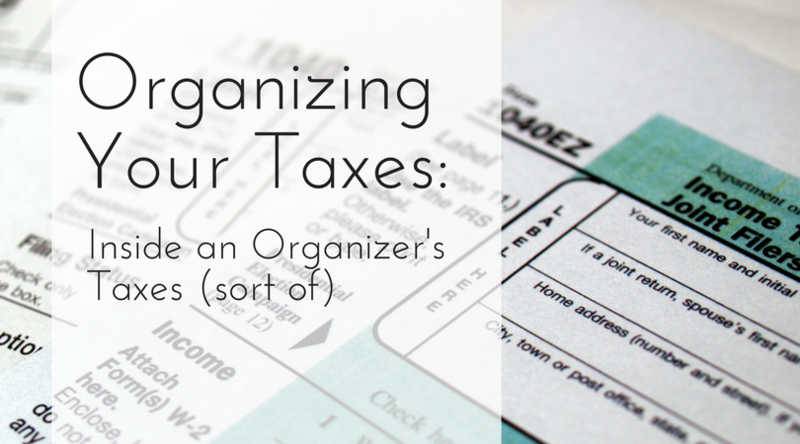 So let’s talk about how to organize your taxes. Disclaimer: I am not a tax professional and I am not giving any actual tax advice. I highly recommend working with a local tax professional (unless you have a very basic return). The “big names” on almost every corner are good if you have a basic return, but those people are typically only there for a few months and likely won’t be in the same place next year. Develop a relationship with someone you can work with year after year. Remember that this person is working with really personal information, and it is nice if you don’t have to explain who you are year after year. Sheila Hansen, CPA is my current tax professional. She charges a flat rate to prepare income taxes (and she tells you that amount up front). You can contact her through her Facebook page at Hansen Accounting Services. Have two folders (one paper and one digital) for each tax year. As soon as you receive a document in the mail or online, put it in the folder immediately. It should be easy to access but not on your kitchen counter. I personally scan anything that comes by mail and put it in my digital file so that everything is in one place. You may think you only need this handy at the beginning of the year, but if you make charitable donations (and you deduct on your taxes) this is a great place to put all of your receipts. If you make a lot of donations, I recommend creating another spreadsheet (because it will do the math) for tracking this information. I also use two different sheets for In-kind donations and Cash donations. For example, with cash donations you may not get the total amount. When we renew our membership at the Joslyn Art Museum, it will state you “Paid this Amount” and this “Amount is Tax Deductible”. Also, when donating items you no longer want, it is a good idea to make a detailed list or at least take pictures to keep with your receipts. Take the time to “calculate” the value while you are looking at the items so you don’t have to figure it out eight months later. If you track mileage, you do not need to keep gas receipts. Scan everything (if possible). On some receipts ink can fade, so if you “need it” in five years, it will likely not be readable. Divide personal and business by year, but it is not really necessary to break down by month. If you track mileage for your taxes, I highly recommend using an app! I save so much time and energy by using MileIQ. It runs in the “background” on your phone and tracks all of your drives. You swipe left for Personal and right for Business. I do it anytime I am waiting (bank drive-thru, etc). If you have places that you go on a regular basis, it can automatically classify those drives. I realize most people don’t have as many “documents” as the Tonjes Moritz family, but the basics are important for everyone. 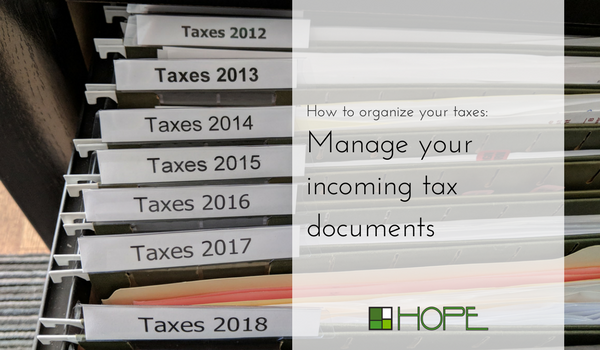 In almost 11 years of business, I have seen a lot of clients’ paper stashes and it can make such a difference if you organize your taxes and prepare throughout the year. Personally, I have received three letters from the IRS in regards to errors in my taxes and I will always consult with a professional and keep anything important (because those letters are scary!). 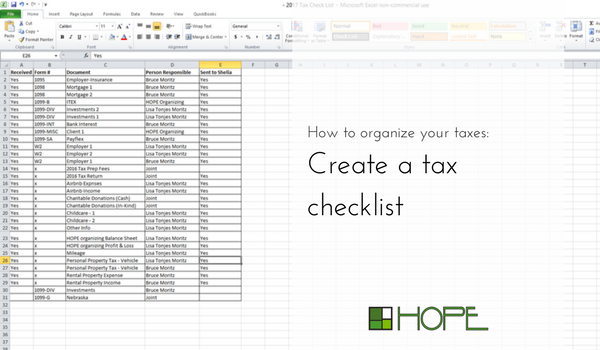 Organize your taxes so that you can spend your time doing more enjoyable things! Contact Lisa if you need help putting a tax organizational plan in place! This is SO useful for small business owners! Being a creative myself, there are many things I like more than taxes. But the organization of things on Google Drive has really changed my time spent on this menial but important task! Thanks Kim! I think one key things is too not wait until tax time to think about it!